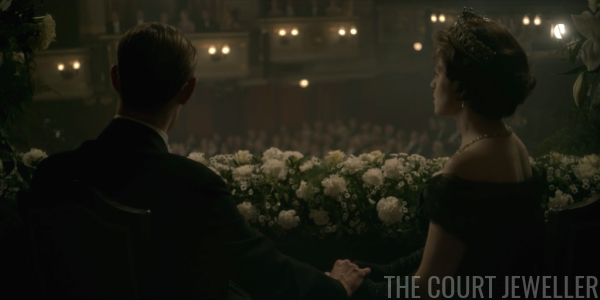 Our look at the jewels of the Netflix original series The Crown continues today with episode three, "Windsor." (If you missed either of our earlier recaps, click here and here!) 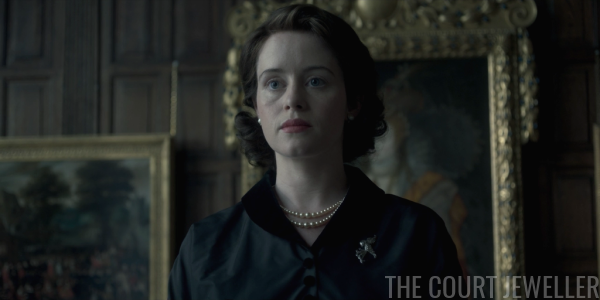 This episode brings us more pearly uniforms, several real-life jewel replicas, and our very first look at the actual crown itself. 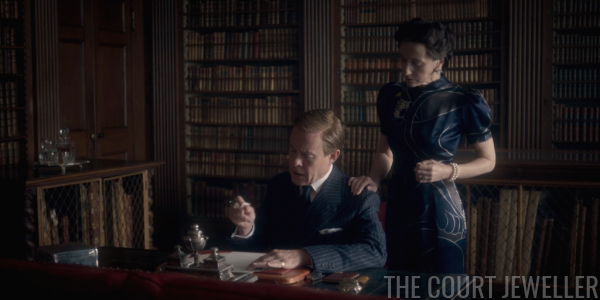 We also get our first glimpse of another significant Windsor: Wallis Simpson. Note that, like the other Windsor women, she's wearing pearls, but rather than a double-stranded necklace, she's wearing a double-stranded bracelet. 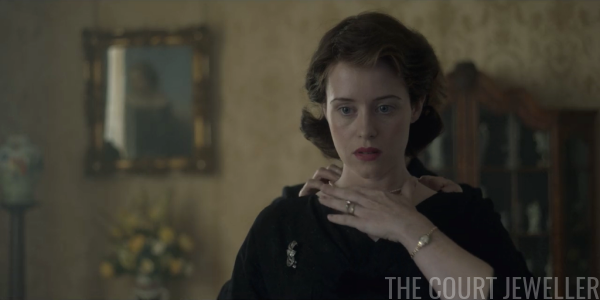 If pearl necklaces are the royal uniform, Wallis isn't quite there -- but she's close enough to royalty that it's about to handcuff her a bit. 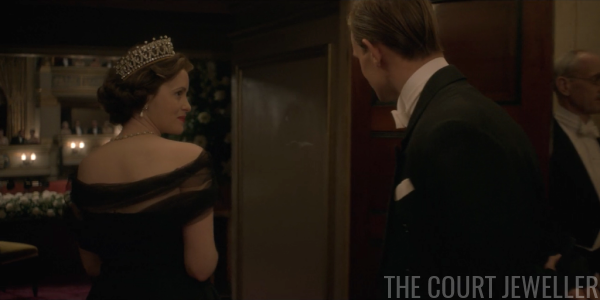 As David drafts his remarks, Queen Mary strides toward him with characteristic purpose. Her pearly royal uniform is almost overwhelming her, more pearl turtleneck than necklace. 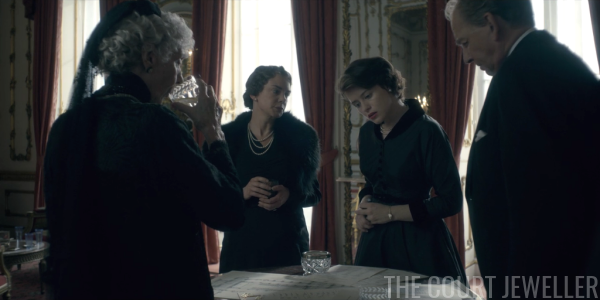 Remember that last episode, her words about royal duty echoed over footage of Queen Elizabeth II putting on her pearls. 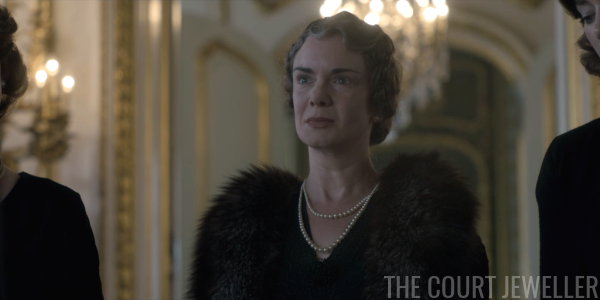 Here, she's armed to try to stop her eldest son from causing even more damage than he already has to the monarchy. 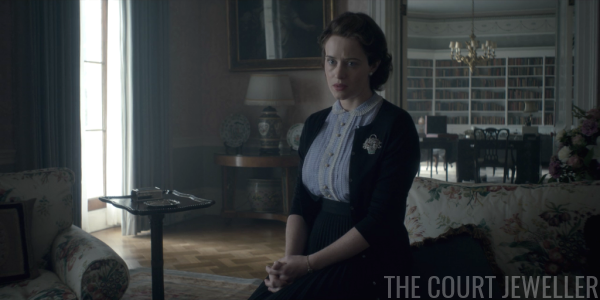 Mary can't stop David from delivering his famous speech, and in London, the new King George VI is listening with his family. Bertie is depicted here wearing two rings -- a signet ring and a gold wedding band -- on his pinky finger. 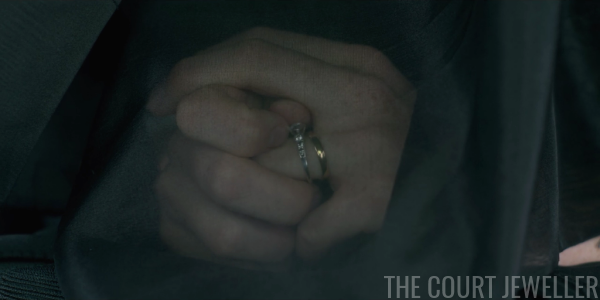 I don't think that he actually wore a wedding ring in real life, but here, it's used as a symbol of his settled, married life. 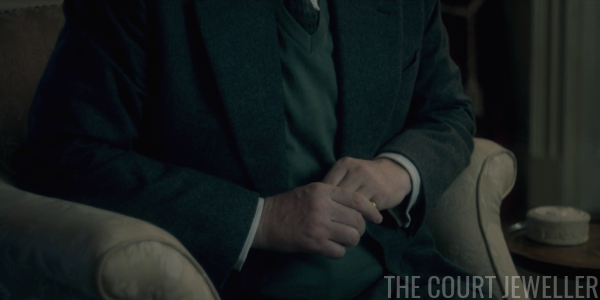 As David notes that the new king has a happy family with a wife and children, Bertie twists the wedding band around on his finger. 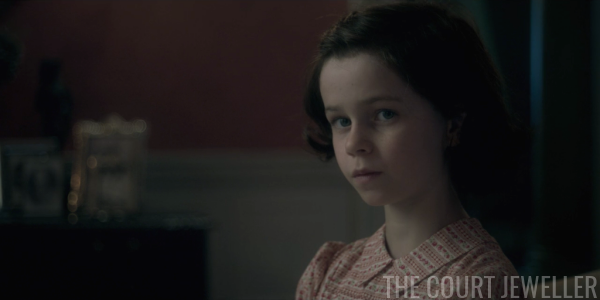 None of this goes unnoticed by the ten-year-old Princess Elizabeth, who shares a knowing look with her father. She understands what the abdication means for her future. Back in February 1952, Queen Elizabeth II is at Clarence House, ready to head to Buckingham Palace to deal with state business and funeral arrangements. She's wearing her pearl earrings and necklace, plus the small "inspired by" diamond brooch that has featured in the last two episodes. 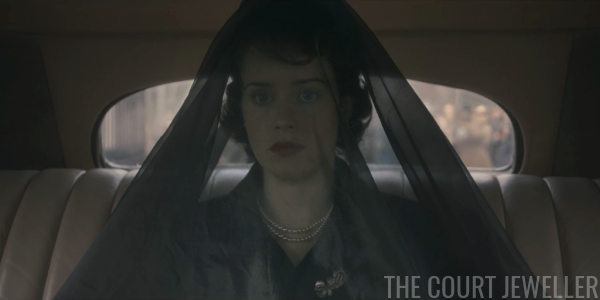 We get another look at the brooch under her veil as she's driven to the palace. At Buck House, Elizabeth is greeted by "their majesties" -- the Queen Mother and Queen Mary. 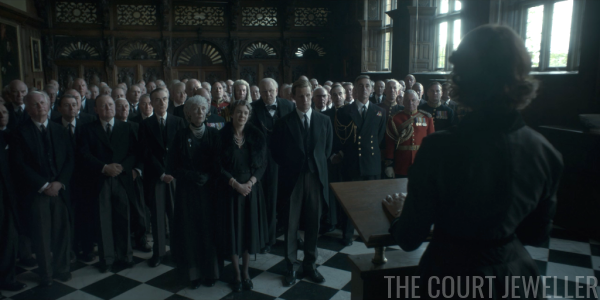 They're all discussing final plans for the king's state funeral -- more specifically, where to put the Duke of Windsor, who has sailed from New York to London to attend the service. 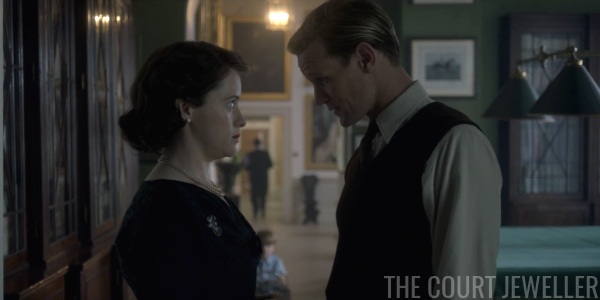 The Queen Mother wants to put him as far as possible from her. 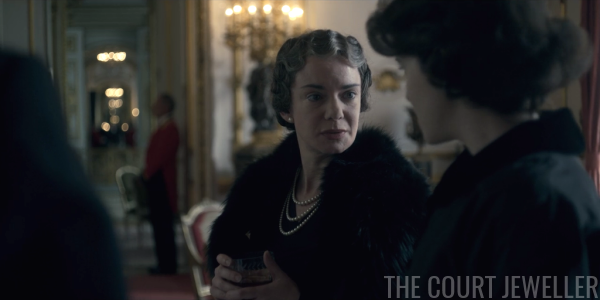 So far, the Queen Mum's jewels haven't been a focus of the production, but here, the camera lingers on Victoria Hamilton and her pearls. The elder Elizabeth is spiteful about her brother-in-law, because she believes his abdication led to her husband's early death. David arrives at Marlborough House to see his mother, who is visibly not thrilled by his appearance. The pearl turtleneck that she wore in the '36 flashback is back here, as are her feelings about people who shirk their duties. 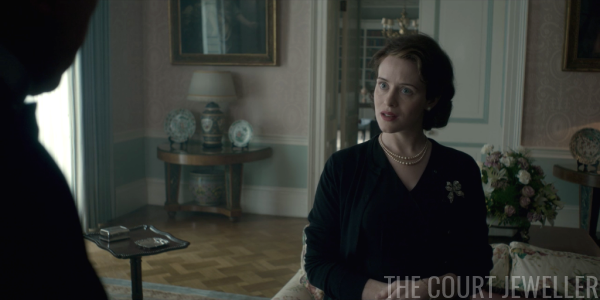 To underscore this, check out the photos displayed on the table: they appear to be mostly pictures of Bertie's family, with Queen Elizabeth II placed prominently beside her. 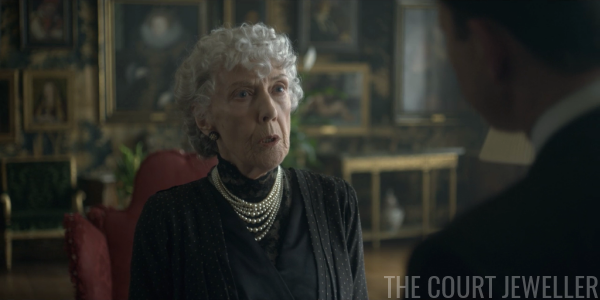 Speaking of pearls: in the next scene, Queen Elizabeth's dresser is fastening hers, and Elizabeth reacts as if she's being garroted by them. 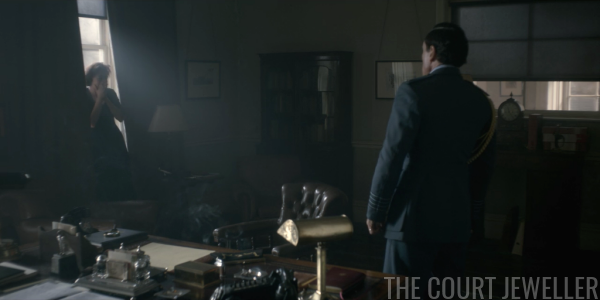 She's putting on the uniform (including the same brooch from the previous scene) for an important meeting: her first audience with Prime Minister Winston Churchill. 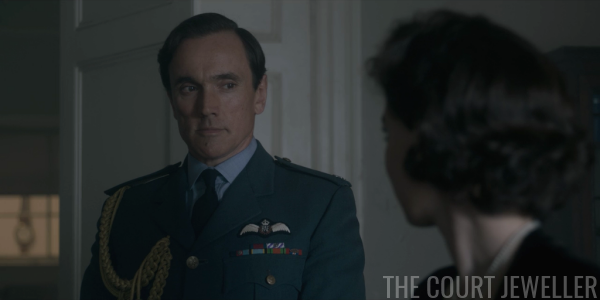 Philip advises her to bring up two points: they want to continue to live at Clarence House, and they want their children to have the Mountbatten name. Churchill arrives, and the two do an awkward "how do these audiences proceed" dance together. 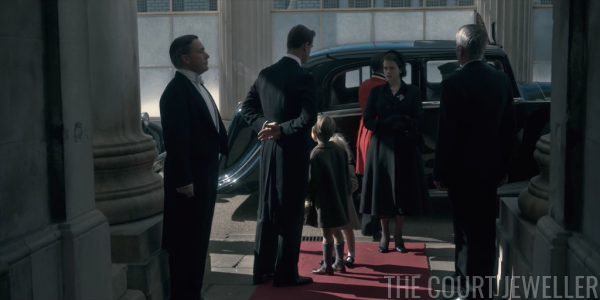 After her meeting, Elizabeth heads back to Buckingham Palace, where she, the Queen Mother, and Princess Margaret all meet with the Duke of Windsor. (This did happen in real life, on 13 Feb 1952, but according to the Shawcross biography, Prince Philip was also present.) 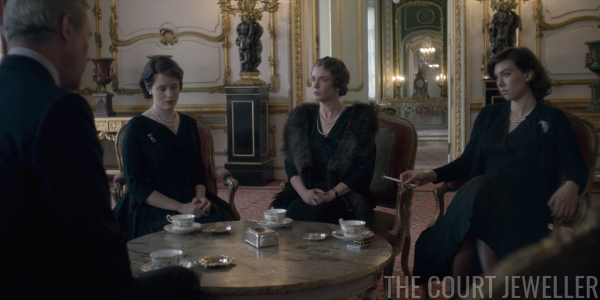 Elizabeth is distracted, the Queen Mother is angry, and only Princess Margaret (who has some Secret Feelings about True Love going on) is willing to give her uncle the benefit of the doubt. 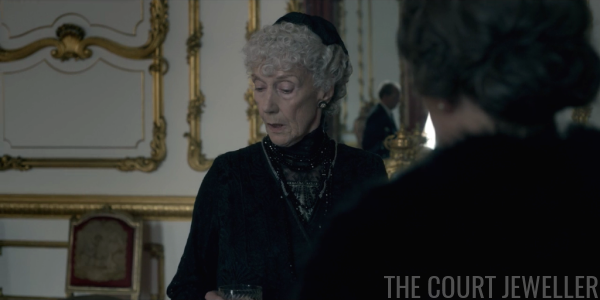 But the Queen Mother stands firm in her hatred of David, and icily informs him that they have to cut the meeting short so they can go to Westminster Hall -- for the public visitation of the king. 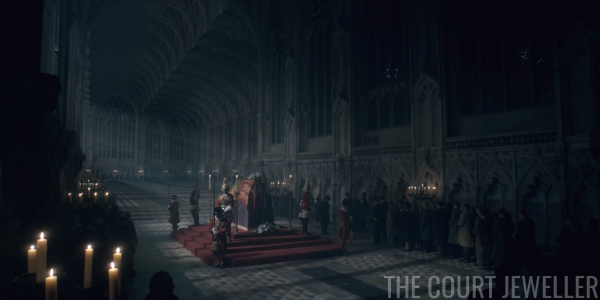 We get a great, evocative shot of the hall where the king is lying in state. And then, we get a look inside St. George's Chapel at Windsor Castle, where the king's burial service took place following the state funeral in London. 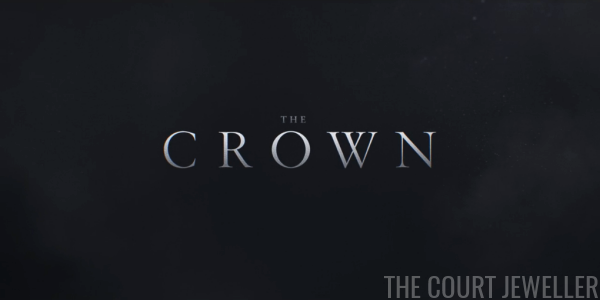 If you look closely, you'll see our first glimpse of the production's version of the Imperial State Crown. It's being removed from the king's coffin before his burial. 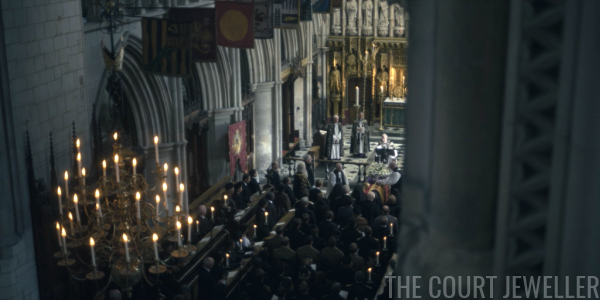 So far in the series, we've seen paper crowns, a Maasai crown, and monarchs who embody the crown, but except for the credits, this burial service marks its first appearance on screen. And still nobody has worn it. Two days after the king's funeral, Louis Mountbatten hosts a shooting party at Broadlands. 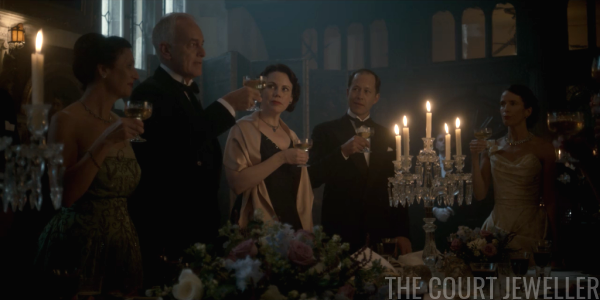 Over an elaborate dinner, he toasts the late king and the new queen. One of the guests at the dinner party is Prince Ernst August of Hanover. He was a grandson of Kaiser Wilhelm II; until German royals were stripped of their British titles in 1917, he was also a British prince. And this is his face as the new "House of Mountbatten" is feted at the dinner. 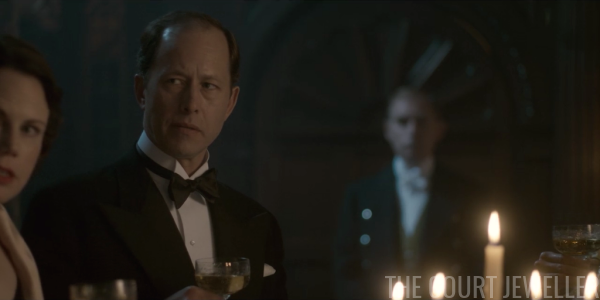 Ernst August hightails it to London, where he chats in German with Queen Mary about the excellent spaetzle at Broadlands before spilling the beans about Mountbatten's dynastic ambitions. 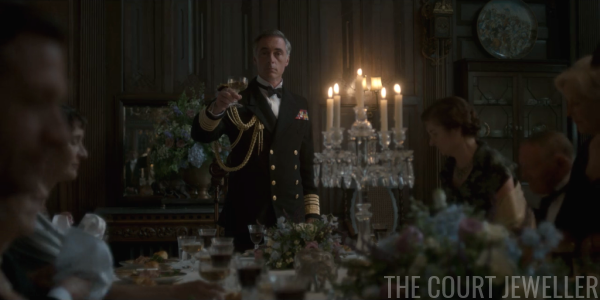 Neither Townsend nor Margaret are able to hide their glee at Rosemary's actions, but before they can celebrate, Prince Philip barges in, and Margaret has to hide behind the curtains. 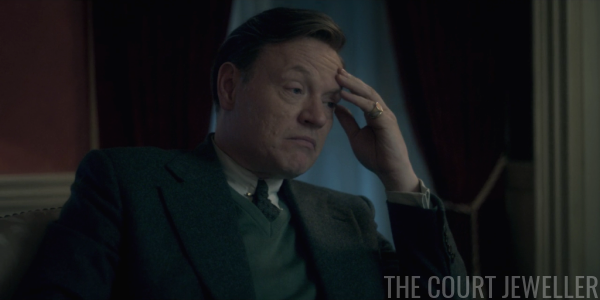 Philip wants to talk to Townsend about flying lessons, even though his sister died in a horrific plane crash (the gruesome details of which he narrates in a rather nonchalant way). The lovers are almost caught, but Philip ends up leaving before he discovers Margaret, who is pretty thrilled that she got away with it. 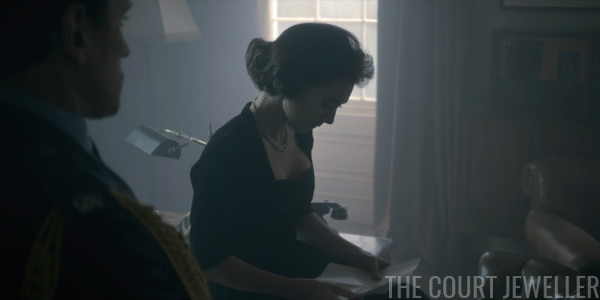 While everybody else is scheming and canoodling, the new Queen is hard at work with her red box full of government documents. She's also wearing another brooch. This stylized diamond bow appears to be inspired by two real-life pieces: the Dorset Bow Brooch (a wedding gift from Queen Mary), and perhaps also the design (but not the size) of the Greville Bow Brooch (which then belonged to the Queen Mother). 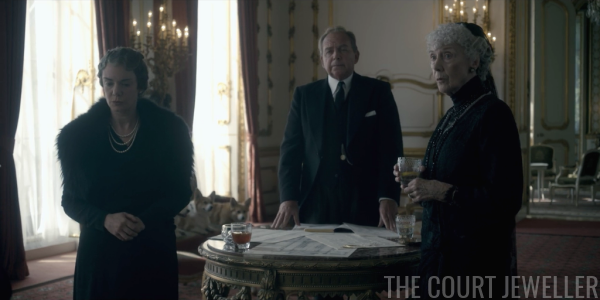 Fueled by the Mountbatten dinner party gossip, Churchill visits the Queen to tell her that she should move to Buckingham Palace and retain the Windsor name. 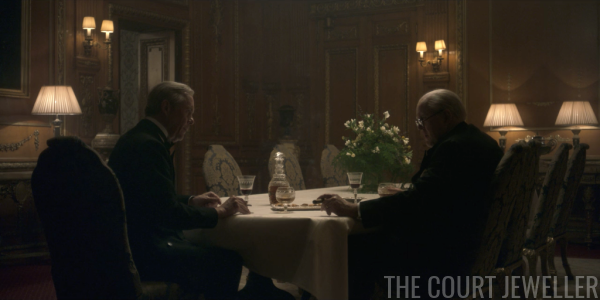 The discussion over the family name and the Queen's residence continues as Churchill has dinner with the Duke of Windsor. As David gets more and more involved with family business, the episode takes some time to explore the reason he's in exile in the first place: romantic relationships. 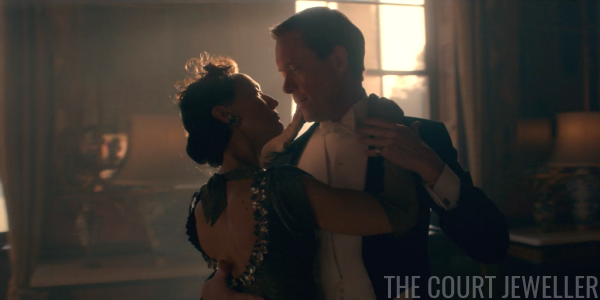 First, we look back at a younger David and Wallis, dancing in a moodily-lit room. 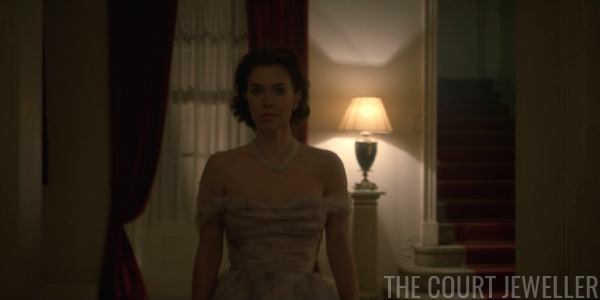 We see Princess Margaret -- who is also thinking about abandoning duty for love -- decked out in an evening gown and proper pearls, striding purposefully through the palace. But she's not on her way to princess duty; she heads straight for Townsend's office, where she does a little kissing and running. Note her smug expression and her disheveled pearls here. At Clarence House, a third couple is depicted together. 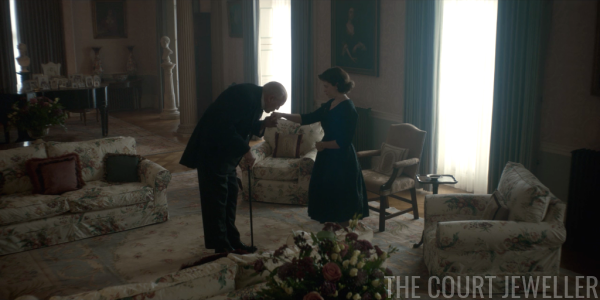 It seems as if Elizabeth and Philip will get a little private time together, as the Queen's dresser is removing her daytime pearl uniform. But instead, she's just swapping it out for her evening dress uniform of an evening gown and jewels, complete with tiara. We've got a couple of real-life replicas here, notably Queen Mary's Lover's Knot Tiara and Queen Victoria's Golden Jubilee Necklace. As usual, the scale of the pieces marks them clearly as costume replicas. 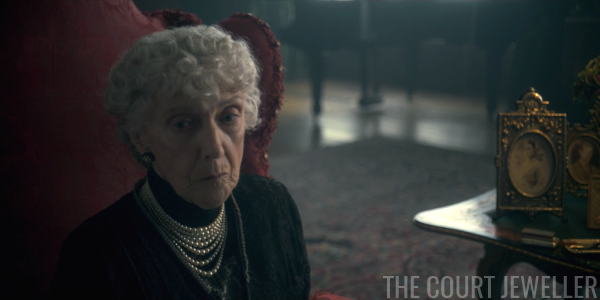 But there's another problem with the tiara: Queen Mary is still alive, and Queen Elizabeth II did not inherit this piece until after her grandmother's death. 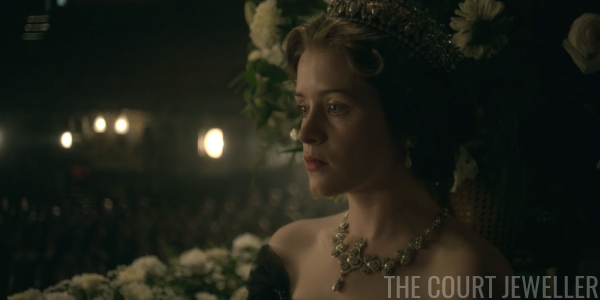 I find it odd that the production would have researched real jewels, but not used them in a historically-accurate way. 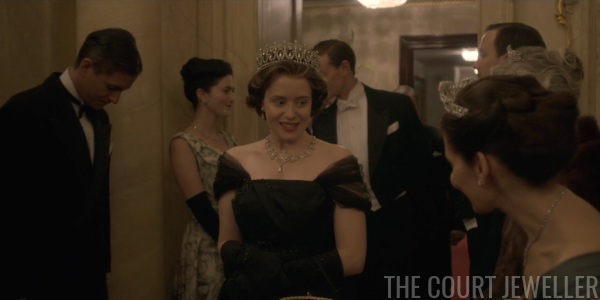 For this scene, they could have used any of the tiaras that the Queen actually possessed in 1952, including the Cartier Halo Tiara, the Nizam of Hyderabad Tiara, or the Girls of Great Britain and Ireland Tiara. 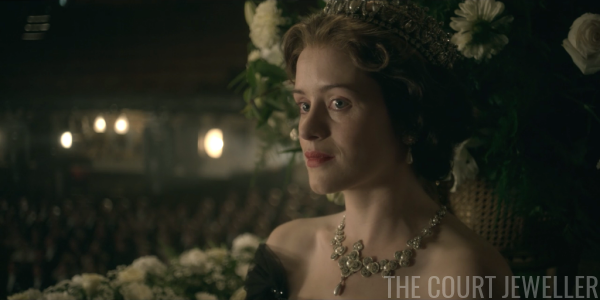 The Queen did receive Victoria's necklace upon her accession, because it's one of the heirlooms of the crown. The scale of this piece is a bit closer to its real-life shape and size. 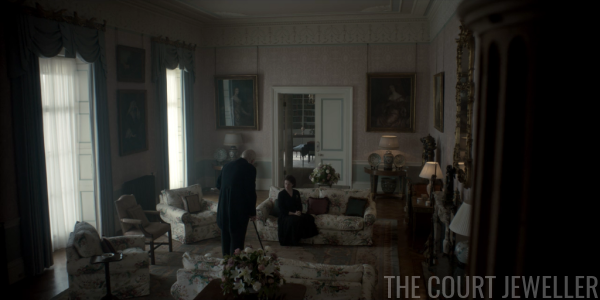 The scene, and Elizabeth's formal attire, mark this outing with her husband as focused on duty rather than passion. 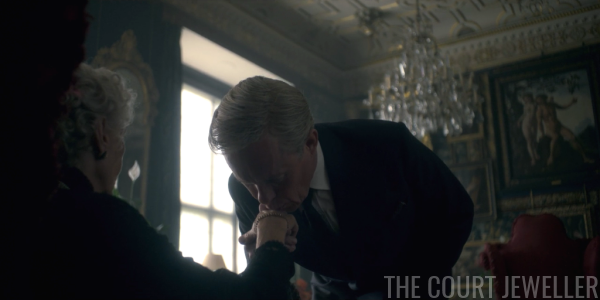 They're together in public, and Philip reaches out a hand to provide his wife with support when she's visibly distressed. Like her grandmother, Elizabeth understands what's expected of her as monarch. Her understanding of love is different from that of David and Margaret. 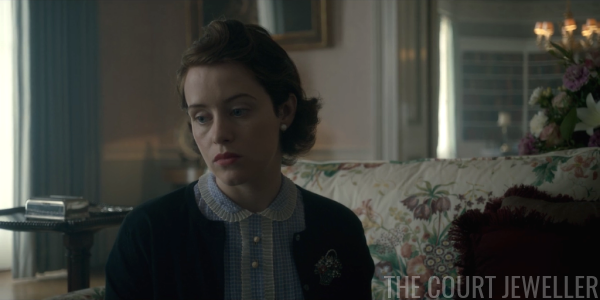 A slightly morose Elizabeth wears another real-life brooch -- the Flower Basket Brooch -- in the next scene. This is a piece given to her by her parents, and we last saw it during her father's surgery. Now, she wears it for a meeting with the Duke of Windsor at Clarence House. 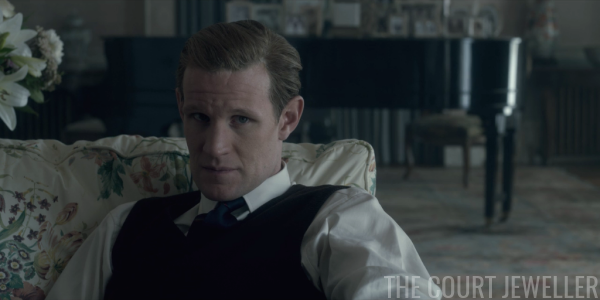 (According to Kate Williams, she really did have him over for tea, though I don't think we know what they might have discussed.) It's a fascinating scene. Elizabeth insults his preference for pugs ("awfully gassy"), reveals that she knows about his insulting nickname for her ("Shirley Temple"), and gets him to apologize for abdicating and making her the monarch. 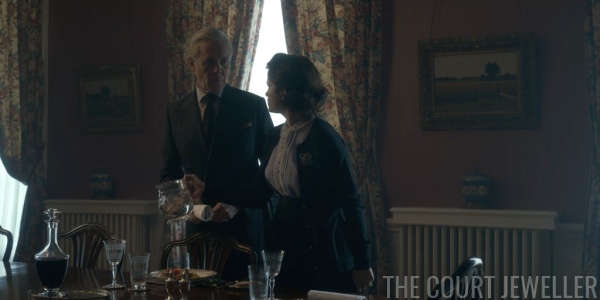 After the luncheon, Elizabeth breaks two pieces of unwelcome news to Philip: they're moving to Buckingham Palace, and she's keeping the Windsor name. Philip is predictably unhappy about both developments. But the Queen is the Queen, and so they pack up and move. 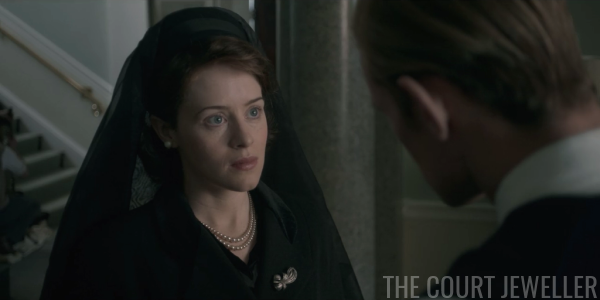 Elizabeth is wearing the "inspired by" bow brooch here. And she also declares that the House of Windsor will remain the House of Windsor. 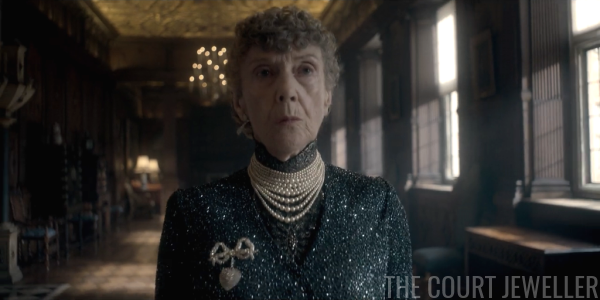 An interesting jewelry note in this frame: it's tough to see, but Queen Mary is wearing the Duchess of Cambridge's Brooch, which features a pearl and diamond cluster and a pearl pendant. 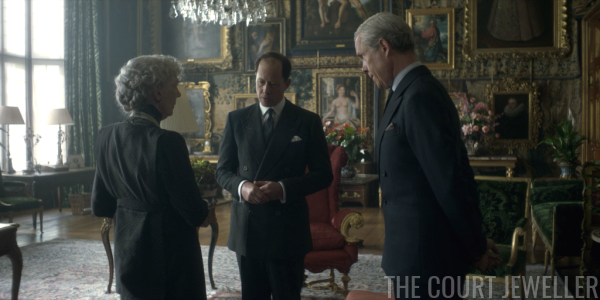 It has a royal legacy that dates back to King George III's daughter-in-law, so it's a good piece to use to signal continuity. 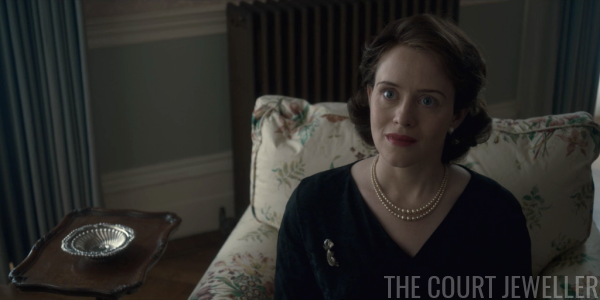 And Elizabeth, who looks weary but decisive, is in her daytime uniform: pearl earrings, pearl necklace, diamond brooch (another "inspired by" piece that appeared in the first episode). 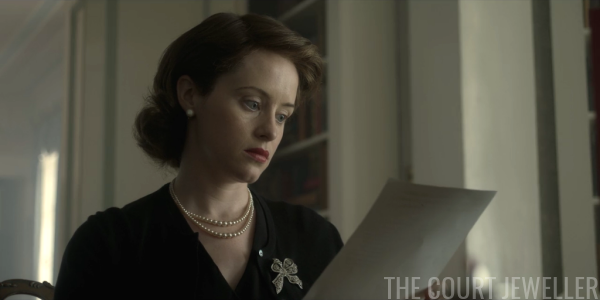 Feel free to share your thoughts on the jewels of episode three -- but no spoilers, please! Look for my recap of episode four on Monday!